Have you ever embarked on a difficult journey, abounding with unknown challenges that you may not be able to overcome? And, in spite of these challenges, have you traveled on your quest with optimistic determination? 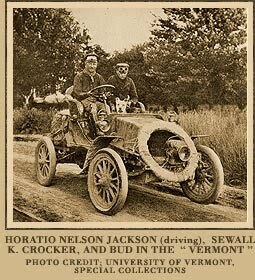 On May 23, 1903, Dr. Horatio Nelson Jackson and his co-driver/mechanic Sewall Crocker set out from San Francisco, California, to drive by automobile all the way to New York City, a quest that had been attempted but never achieved. The obstacles on their trip: bad roads (in 1903, there were only 150 miles of paved roads, all within city limits), no good path through the mountains, no gas stations, towns that were far apart, a car that broke down frequently, and car parts had to be transported to them via stagecoach and railroad. Nipping on their heels were 2 other teams of cars trying to make the journey and beat Jackson and Crocker to New York. His car, which he christened the Vermont in honor of his home state, splashed through streams, got stuck in buffalo wallows, bounced over railroad trestles to cross major rivers, and frightened horses on the dusty trails. And as he moved eastward, his quest slowly became a national sensation, with huge crowds (tipped off by the telegraph of his approach) lining the streets of town as he whizzed through at 20 miles per hour. "It Startled the Natives," one headline proclaimed; another announced "A Real Live Auto." This was America's first transcontinental road trip, and like all road trips that would follow it included the usual mix of breakdowns and flat tires, inedible meals and uncomfortable beds, getting lost and enduring bad weather — and having a truly unforgettable experience crossing the nation's vast landscape. Throughout it all, Jackson's indomitable spirit and sheer enthusiasm was as indispensable as the fuel for his car. Partway through his improbable journey, Jackson learned that his spur-of-the-moment trip had turned into something of a race. First the Packard company, and then the Oldsmobile company dispatched their own autos from California in the hopes of passing him and gaining the publicity of being first across the nation. Sixty-three and a half days after leaving San Francisco, Jackson arrived triumphantly into New York City and claimed the honor for himself. This cross-country journey by horseless carriage had been attempted a few other times in the first three years of the 1900s, but Jackson and Crocker were the first to accomplish the feat. Why? I believe they made it because Jackson had an incredible "never give up" attitude. In spite of all of the difficulties and all of the break downs, Jackson displayed optimistic determination. We can see his optimism in the letters he wrote to his wife on the journey. As you read the following samples, note that Jackson acknowledges all of the challenges and problems, but because he is so optimistic, he thinks that once they make it past a particular hurdle, all will be smooth sailing to New York City after they can get back on the road. I am rather provoked over our delay... I have lost 5 1/2 days. This is a bad start for our first eleven days out. Just as soon as I can get decent tires we will make a record run. I feel more confident that I can make New York. Crocker is more interested than ever & is keeping the machine up in good shape. Just a line to say that everything is alright with your wandering boy. I can’t write much, as we sleep, then work. We arrived here at 12 o’clock this noon with the running gear of one of the front wheels gone. We have it patched up & shall leave in the morning hoping that it will take us to Cheyenne. When you hear that we have reached Rawlins, Wyoming, you will know that I can make the trip a go -- so bet all the money you have got on it. ... Well old girlie, I can’t say any more -- you know how I feel. I shall make up for lost time. As you can see in his letters to his wife, every problem he is encountering with his 1903 Winton is just a slight setback. He's frustrated, but he has every confidence that they will indeed make it to New York in record time. He has no doubt. He is a visionary. He has optimistic determination. So how about you? Do you let every major or minor problem cause you to just throw in the towel, or do you have the same outlook on life as old Horatio? Be an overcomer through Christ. for everyone born of God overcomes the world. This is the victory that has overcome the world, even our faith. Who is it that overcomes the world? Only he who believes that Jesus is the Son of God (1 John 5:4-5).